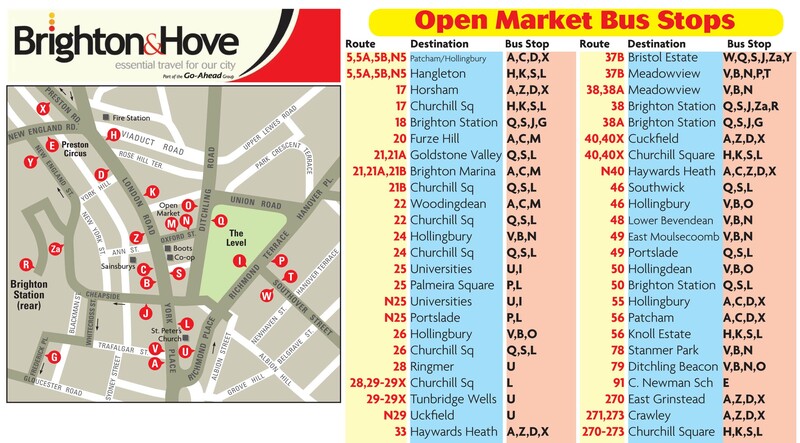 Brighton Open Market has two main entrances: one is located on Marshalls Row, just off London Road; the other is on Ditchling Road, just across from The Level. The market is extremely well-serviced by public transport. Brighton’s Main Rail Station and London Road Station are both only about a 10 minute walk away. Bus information is below (click to enlarge). There are several car parks within a short walk and paid street parking nearby. There is no parking on site at the market. The market has several bicycle racks available for public use. These are located near the Ditchling Road entrance.